Weight Gain: +12 lbs (from pre-preg weight). Symptoms: I’m having great hair lately…it’s not falling out constantly like normal and is nice and shiny. It’s been nice to not have to constantly pluck it off my clothes all day long. Cravings/Aversions: Still nothing…I don’t think I’m going to develop any dramatic aversions or anything this pregnancy. No change here. Sleep: Still good! I just want more and more. I am loving: That we get to go pick up the crib and glider and ottoman! Thankfully they didn’t take long at all to come in, so soon, they will be in the room. Now, as to when we will actually put them together, I have no idea. I miss: All my visitors. And especially Ada. It was so nice having such a sweet and cuddly baby in the house. Movement: Good! Even the midwife got her hand kicked during my appt this week! Nursery progress: I took some pictures of the piles of stuff that are currently in there, and the bassinet and cradle, but I’ll post those in a different post. Exercise: I went to yoga this week, and we did a lot of relaxation, which was just what I needed given how hectic and stressful the week had been after dealing with all our visitors leaving and trying to get work as caught up and settled as possible before I started working from home. Looking forward to: Getting the baby furniture and starting to work from home next week. Yessssss! Work has been so, so busy lately, and what with family visiting and my packed social calendar (heh. ), I just have not had the extra time to post anything other than the standard weekly update progress reports, and I know that can get kind of old after a while, with nothing else to break it up in between. SO! 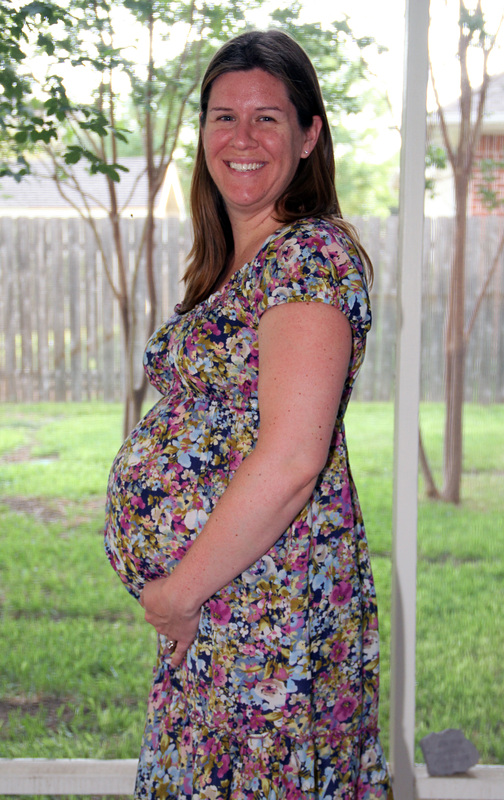 Here I am to announce that today marks the official ‘100 days left’ portion of this pregnancy. After today, we’ll be in double-digit territory! We have baby furniture on order, two (2!) baby showers in the works (how lucky are we, I ask you? ), and the other day I went through the accumulated clothes that this baby already owns…and let’s just say, he won’t be going around naked, that’s for sure. Everyone is very excited about this baby’s arrival, and I can’t help but feel so amazed that someone who is not even here yet, can have such a huge impact on so many people. I mentioned before that my friend Kristi is throwing us a local shower here in Austin, and now also the ladies in Scott’s family have also offered to throw a shower in Houston for all the Houston family/friends! The Austin shower will be on Sept 24th, and the Houston shower will be on Sept 3rd. I sort of feel like I should start to see if I know anyone in Dallas and San Antonio that also needs to throw a shower, so that my tour of major cities of Texas will be complete. 🙂 Honestly, though, I am so excited for these get togethers with all my family and friends. I don’t get to see everyone nearly enough, and if you offer me the chance to get to hang out and visit with them all, AND you serve me cake and punch, it’s pretty much the best thing I can think of. I’ve got another post brewing for sometime in the next several days…sort of a recap of the visit Scott and I just had with some of my family, and there should be pictures included. I know everyone loves pictures! Also, I’ll include my most recent midwife appt update. (Spoiler: it went fine). But for now…back to work! 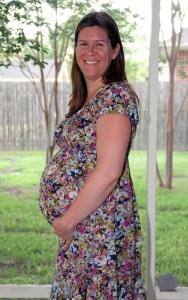 Due Date: November 4, 2011 – 105 days to go! Weight Gain: +11 lbs (from pre-preg weight). Symptoms: Nothing new this week. Magnesium supplement has helped the leg cramps, so I’m back to sleeping great! Cravings/Aversions: Still nothing…I don’t think I’m going to develop any dramatic aversions or anything this pregnancy. I am loving: Fun visiting with sisters, and nieces! Lisa, Ada, Ali and Grace are all here and yesterday we shopped and shopped. Today we’re slated for some pool time! Josh arrives tonight so the fun continues! I miss: Winter? Less than 100 degree days? 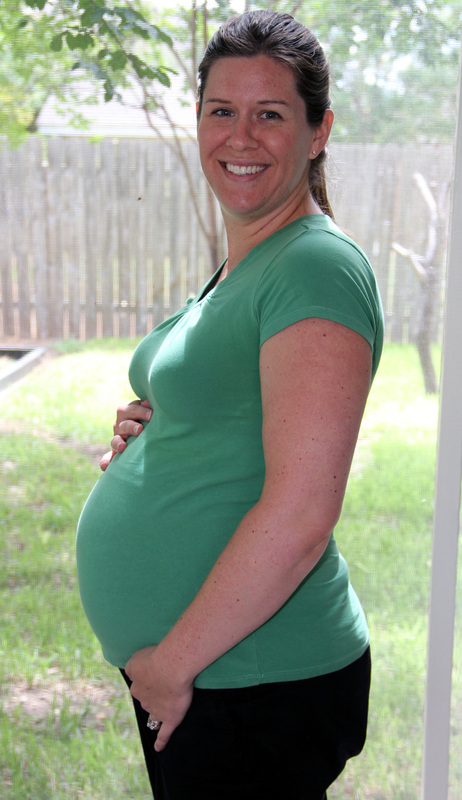 Movement: The movement continues…it’s starting to be more and more noticeable where the baby is in my belly. He seems to like hanging out on my right side, so it’s staying a little lopsided depending on where he is at the moment. It’s neat to be able to push on the belly and actually feel something in there! Nursery progress: No real change, except that now there is a bassinet and cradle and in-bed sleeper in there (courtesy of Ali and Meredith) and lots more baby clothes (courtesy of Lisa and Mom.) The cradle is one that my Dad made back when Meredith was born, and we are passing it through the family as babies are born. It’s getting some good use. Looking forward to: Swimming today and the wedding on Saturday. And then my next midwife appointment on Tuesday. (I think this is the last ‘monthly’ appointment and after this one I start going every 2 weeks. EEEk! 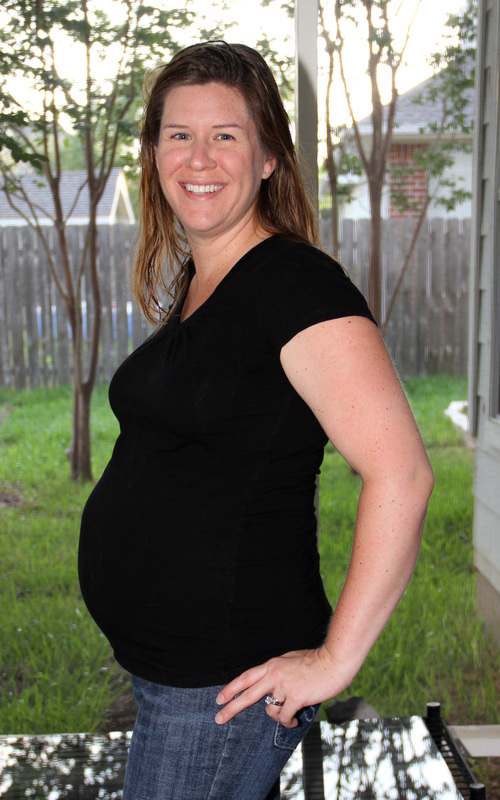 Due Date: November 4, 2011 – 112 days to go! Symptoms: Nighttime leg cramps have begun. I could do without those. Thankfully I had a heads up from Lisa to take a magnesium supplement if I started having them, and so I tried it last night, and taadaa! No cramps. Cravings/Aversions: Nothing I can think of. Just food, food, food. Sleep: The 2 nights of leg cramps sucked, but we’re back to normal now, I think. Zzzzzzzzz. 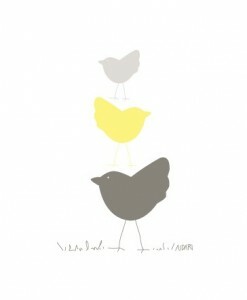 I am loving: LISA AND ADA GET HERE IN 2 DAYS! (If you don’t count the weekend or the day they get here.) So, that would be Wednesday for those of you not well versed in our visit-countdown methods. I miss: I just sat here for a bit and tried to think of something, but really, I’ve got nothing. I’m leading a pretty charmed life and I’ve got no complaints. Movement: The trend I notice is that I get some good baby-moving action once I sit down after being up and moving around for a while. I can pretty much sit down and within a few minutes, the movements start. Oh, and I have noticed that I have felt him moving around about 3 or 4 times now while I’ve been standing up. Nursery progress: About the same this week as last. The closet is now almost cleared out, though. It won’t be long now till there are some little clothes hanging up in there! Exercise: Nothing. It was a really long busy week at work and I missed both Pilates and Yoga. Only a couple more weeks till I’m down to part time and working from home, so these last weeks in the office are going go stay really hectic while I’m doing training and trying to clear up any old loose ends. Diet: OK. This is kind of a boring subject so I’m trying to think of something else more interesting to replace it….I’ll keep you posted. Looking forward to: Baby cheeks to kiss! Going to the pool! Shopping with Lisa! Here’s week 24! It was SO hot outside..maybe around 100, or upper nineties for sure. I feel like I look awfully big for 24 weeks, but whatever. I'm growing an athlete in there! Due Date: November 4, 2011 – 119 days to go! Weight Gain: +10 lbs (from pre-preg weight). Symptoms: Apparently I’m snoring more! Cravings/Aversions: Ice cream always sounds good. If you ever are in an emergency situation and need to know what the current DQ Blizzard of the Month is, just ask me. I stay on top of these things. Sleep: For me: fine. For Scott: could be better (see above re: snoring). I am loving: The increased and stronger movements! I miss: Not absolutely having to take a bottle of water with me everywhere I go. I mean, it’s probably a good habit to form, especially since I’m ALWAYS thirsty, but it’s just one more thing to remember on my way out the door. Movement: Yes! Getting stronger and more frequent. I can regularly see my belly move from the outside now and it cracks me up every time. So surreal! Diet: Eh. Could be better; could be worse. Looking forward to: Getting to start setting stuff up in the baby’s room. Which means digging through all the bags and piles of stuff I already have accumulated, and oohing and aahing over it all again. A quick note to mention that my wonderful friend Kristi has offered to throw me a baby shower, and I couldn’t be more excited! The date has been set for September 24th, so hopefully it’s enough advance notice for everyone to plan if they can make it. Invitations will be sent out…this is just a heads up on the date so you can mark it on your calendars/phones/email/foreheads! It’s an occasion for punch! So, this weekend was full of projects and progress! The baby’s room is *almost* all the way empty now. Just a few more things to clear out and it will be paint touch-up time, and then I can go to town. My little starter pile of baby stuff that was in a corner of the guest room has been growing and is quickly taking over one whole wall! Granted, everything is still in bags and packaging, so once it is opened and organized it won’t seem like nearly as much, but for now it is staying as-is for easy transport to its forever home in the yellow room. Scott was able to check another project off his list when we installed some shelves in his arcade room for display and storage purposes yesterday. While I didn’t get up on the ladder, or do any drilling, I still say “we” since I was an active participant, and handed him tools and peeled labels off the shelving pieces like nobody’s business. Now that the shelves are up, the lingering things out of the baby’s room have their official place to be relocated to, so we’re in the home stretch! In anticipation of the day when I can start putting the fun stuff in the room, I’ve made a couple of small, decorative (otherwise known as OH MAN BABY STUFF IS SO CUTE I CAN’T RESIST!) purchases. 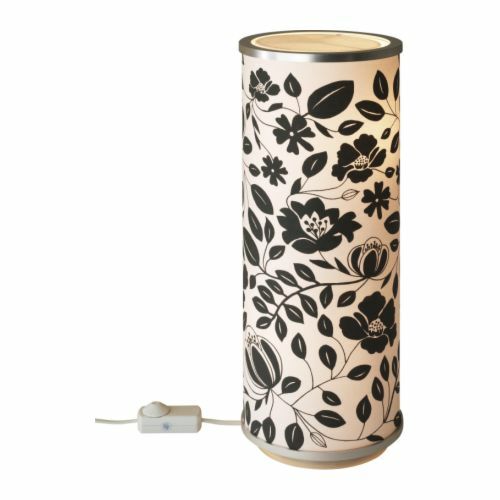 Well, this lamp wasn’t originally intended to go in the baby’s room, and isn’t technically ‘baby stuff’, but I have since decided it will be perfect in there, so just humor me. And this was an Etsy purchase that was just too good to resist! It’s an illustration that will need to be framed once it arrives (I think a white frame will be the best.) Since the middle bird is pretty close (I’m hoping) to matching the color of the walls, it should look darn cute once it’s framed and hung up. Also, in case anyone wanted an update – our new sprinkler system is FAN-tastic and already the grass is looking so green and fluffy! Several shoots have already started creeping into the barren areas, much faster than I was anticipating, so I think within just a couple more months, it should be well on its way. At 11 inches (the length of a spaghetti squash) and almost 1 pound, your baby is starting to look like a miniature newborn. His lips, eyelids, and eyebrows are becoming more distinct, and he’s even developing tiny tooth buds beneath his gums. His eyes have formed, but his irises (the colored part of the eye) still lack pigment. If you could see inside your womb, you’d be able to spot the fine hair (lanugo) that covers his body and the deep wrinkles on his skin, which he’ll sport until he adds a padding of fat to fill them in. Inside his belly, his pancreas — essential for the production of some important hormones — is developing steadily. 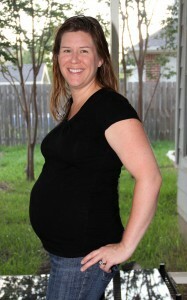 Due Date: November 4, 2011 – 126 days to go! Weight Gain: +9 lbs (from pre-preg weight). Symptoms: Not much this week, I don’t think. Relatively calm! Cravings/Aversions: I think I need to start cutting back on my portion sizes. Food just tastes really good, but it’s hard to breathe when I’m so full! Sleep: I’m feeling lucky because so many things about this pregnancy have been really easy, and the fact that my sleep, so far, has remained just as awesome as normal, is right at the top of that list. I really hope this baby inherits Scott’s math skills and my sleep habits. I am loving: The couch. It’s so comfy. Although hard to get off of without some rocking back and forth momentum. I miss: Still nothing that I can think of. Well, maybe the only thing is that I need to find a dress to wear to a wedding soon, and all the regular dresses that are in stores right now are so cute, but the maternity selection is pretty limited. Bummer. Movement: More frequent and more distinct. The other night I rolled from my side to lay on my back a few minutes and I felt about 4 good thumps right in the middle of my belly – I could feel them just fine from the outside even – nice and strong! But no more like that since then…so I’ll keep waiting. Nursery progress: About the same…Scott is taking some days off from the crazy ‘cleaning up and out’ schedule, but is already planning on getting back to it. Exercise: We walked around Babies R Us for about an hour tonight making our registry. That counts, right? Diet: Not bad. At my midwife appt this week, I told her I was feeling bad since I wasn’t taking in very many of the ‘dark green leafy vegetables’ we all hear touted so much. She reassured me that I didn’t have to each broccoli everyday, and that the variety of other colored veggies I was eating was excellent. So I felt redeemed. Looking forward to: Lisa and Josh and Ada coming to visit very soon!! We’ve got some pool time planned.